Yet another good friend had a baby recently and I really wanted to make a quilt for little baby Benjamen (Leslie if you're ready this, sorry to ruin the surprise!). I saw these Riley Blake prints and immediately ordered a fat quarter set (In Highway Roads colorway). I didn't have a pattern in mind - but I remembered the Hedgerow Scrappy Tutorial from Oh Fransson! and started making blocks loosely based on the tutorial. 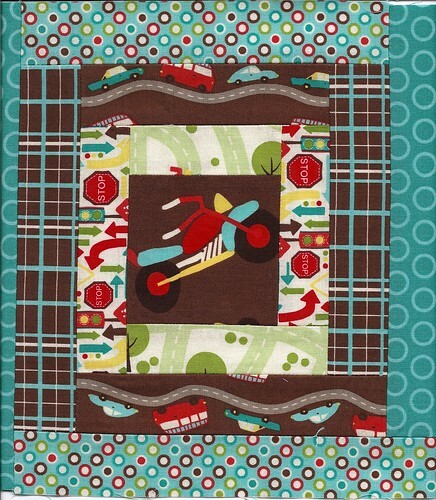 I started by cutting out 12 3.5" squares from the blue and brown large car/motorcycle/bus/bike print. 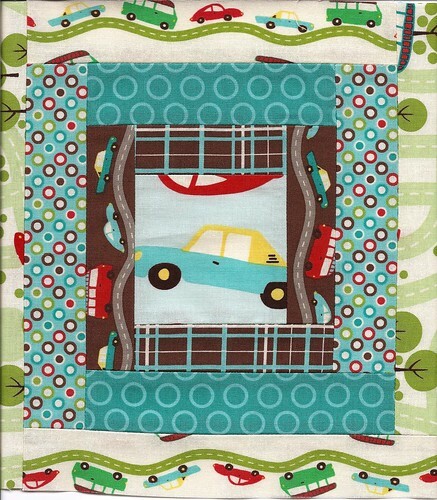 I then added 1.5" and 1.75" strips to keep a "scrappy look" while at the same time using coordinating fabrics. I'm not completely in love with this yet- but I think once it's done and sashed in some great light blue fabric it won't look so busy. What do you think? Is this going to make the poor baby look cross-eyed with all the fabric craziness? Adorable! Who couldn't love this? You are so good at putting colors and ideas together. I can't wait to see it finished. I think it is going to be awesome! I think you are right- it will be even better once sashing has been added. I can't wait to see the finished product! love the blue and brown!! !